These findings were published in PLoS One. More information on the Bershadsky lab and the Sheetz lab. Figure: An illustration depicting rosette formation during Drosophila germband extension. The dorsal (blue) and ventral (pink) cells put forth wedge-shaped protrusions on their basolateral sides which facilitate basal rosette formation. Apical rosettes are formed by actomyosin contractility between cell junctions along the anterior-posterior axis. 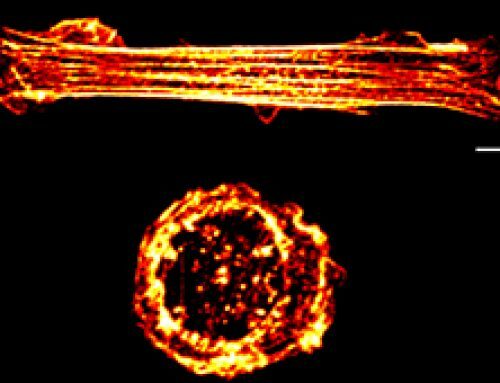 The mature actin cytoskeleton is formed from crosslinked stress fibers and provides structural stability to the cell, as well as a transport network for biochemical substances and mechanical forces. However, when stress fibers are disrupted by mechanical force or toxins such as latrunculin A or cytochalsin D, cytoplasmic actin re-organizes into an nodal network. While previous work has revealed that the formin disheveled-associated activator of morphogenesis 1 (DAAM1) associates with these actin nodes, the exact function of DAAM1 in actin organization was unknown. Compounding this issue, DAAM1 is typically localized to membrane structures, either the plasma membrane or internal vesicles, raising the question of how DAAM1 associates with actin nodes in the cytoplasm. In this study, Luo et al use FRAP to discover that DAAM1 mobility is reduced when it is in close proximity to actin, reinforcing the idea that DAAM1 is closely associated with actin filaments. However, when actin filaments are depolymerized by latrunculin A, DAAM1 becomes free to move, and it associates with the newly formed actin nodes and stabilizes them. At these nodes, DAAM1 organizes short actin filaments, providing the foundation for the regrowth of actin filaments and stress fibers. How does formin mediate actin nucleation? Actin filaments (F-actin) are linear polymers of globular actin (G-actin) subunits and occur as microfilaments in the cytoskeleton and as thin filaments, which are part of the contractile apparatus, in muscle and nonmuscle cells. They commonly underlie the plasma membrane and are typically assembled at the cell periphery from adhesion sites or sites of membrane extension. Actin filaments can create a number of linear bundles, two-dimensional networks, and three-dimensional gels, and actin binding proteins can influence the specific structure the filaments will form. Although a large body of work suggests that F-actin can exist in multiple states, in general, an actin filament has a total rise of 27.3 Å between subunits on adjacent strands and a rotation of 166.15° around the axis. An actin filament is flexible, has a helical repeat every 37 nm, ranges from 5-9 nm in diameter, and has 13 actin subunits between each cross-over point (produced by the ‘crossing over’ of the two long-pitch actin helices). An exception is the case of sperm, where a crosslinker protein, scruin, maintains the actin in a coiled state and extends upon activation. In the acrosomal actin rotation angle of one of the strands is 167.15° while the other strand is tilted more than usual to fit into an asymmetric helix. The formins are a large family of proteins that facilitate the nucleation of new, unbranched filaments by promoting the interaction between two actin monomers. Under normal circumstances formins are auto-inhibited through structural interactions between the two ends of the protein. However, conformational rearrangements resulting in their activation can be induced through interactions with GTP-bound (active) Rho GTPases. This process remains poorly understood. The tumor suppressor adenomatous polyposis coli (APC) was shown to bind the formin mDia1 and overcome capping protein- and profilin-mediated suppression of spontaneous actin nucleation, resulting in the initiation of actin filament nucleation and elongation. In the mechanism described, APC is primarily responsible for actin monomer recruitment, whilst mDia1 catalyzes filament elongation. Actin recruitment by APC did not involve capturing F-actin intermediates that had spontaneously formed nor did APC contribute to filament elongation. In this model, once actin polymerization commences the APC-mDia1 complex separates – mDia1 is propelled away from APC along with the growing barbed end of the filament and APC remains attached to the filament at the site of nucleation. Although a consensus has yet to be reached for the mechanism of formin-mediated nucleation, it is now well-established that activated formins function as dimers and form a donut-shaped complex around terminal actin subunits, orientating themselves toward the (+) end of the actin filament or nucleus. This binding is facilitated by FH2 (formin homology 2) domains within the formin monomers. Next, each formin monomer binds and captures profilin units, which are themselves already bound to G-actin monomers. This interaction is mediated by multiple stretches of polyproline residues within the FH1 domain of formins. This domain is known to range from 15-229 residues, consist of between 35% and 100% proline residues, and contain up to 16 profilin binding sites. Profilin maintains a steady pool of actin monomers by promoting ADP to ATP nucleotide exchange on G-actin. These monomers of ATP-G-actin are then added the growing actin filament. The coupling of formin with the growing end prevents capping and allows continued growth of the filaments. The first step in actin polymerization is known as ‘nucleation’. This step sees the formation of an actin nucleus, which is essentially a complex of three actin monomers, from which an actin filament may elongate. Although non-muscle cells have a high concentration of G-actin-ATP (~100 μM), pure G-actin monomers fail to nucleate new actin filaments efficiently due to the instability of actin oligomers. Additional factors are therefore required and although the exact mechanisms behind filament nucleation remain to be clearly defined, two models, each involving distinct mechanisms and proteins have been proposed. Importantly, these mechanisms are not mutually exclusive and it maybe be the case that nucleation of actin filaments results from a combination of both mechanisms. In the first model, known as the ‘tip nucleation model’, members of the formin family of proteins cluster at the plasma membrane and initiate the nucleation of actin filaments. Formin subsequently mediates filament extension with the structural integrity of the filament bundles maintained by fascin cross-linking. The alternative model is known as the “convergent elongation model”. In this model, the Arp2/3 complex, which is more commonly associated with lamellipodia formation but has been found to be critical for filopodia initiation, plays a role. Here, Arp2/3 complex nucleated branches continually develop from the actin filament network located at the leading edge of the lamellipodia. These filaments are proposed to gradually converge, forming a bundle that is secured by facsin cross-linking. This cytoplasmic nodal actin network is held together by DAAM1, a formin that typically associates with the membrane. Other nodal network components are the crosslinker filamin A and the motor protein myosin II. Similar results were observed at the membrane with latrunculin A treatment, although structural changes were also evident; the cell edge was initially concave, and straightened out when actin filaments were disrupted, but recovered the concave shape after latrunculin A was removed. The researchers created mutations in DAAM1 to force localization either to the membrane or cytoplasm. Expression of cytoplasmic DAAM1-NC led to the formation of an cytoplasmic actin meshwork comprised of short actin filaments, not the long filaments typically observed in the actin cytoskeleton. 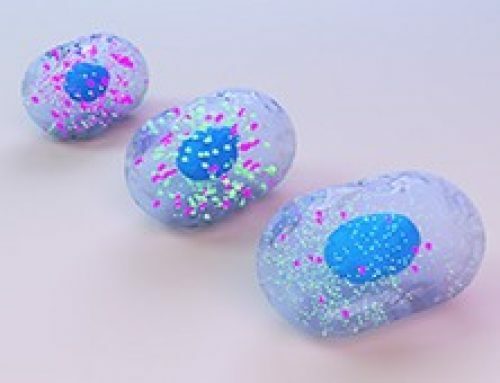 However, a strategy to induce membrane translocation of DAAM1 by rapamycin treatment did not work as expected, with DAAM1 remaining in the cytoplasm. 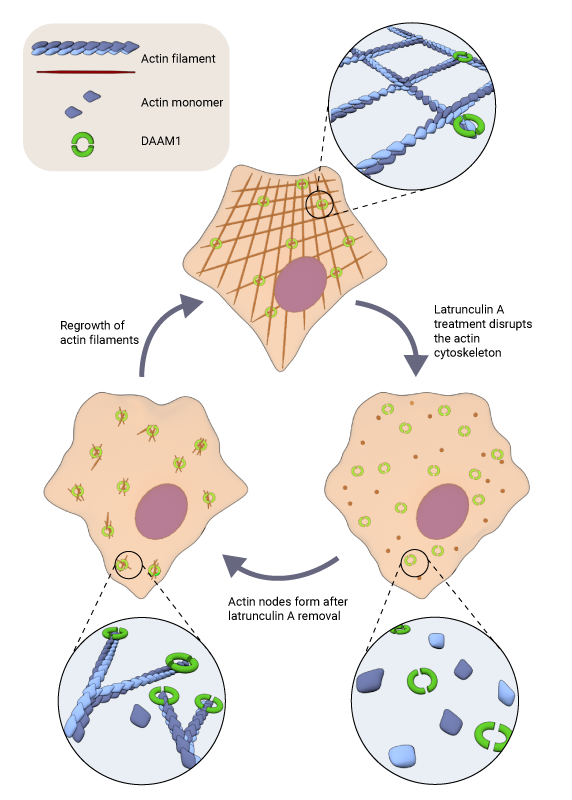 Actin depolymerization by latrunculin A was required to separate DAAM1 from association with actin filaments, upon which rapamycin could induce membrane localization of DAAM1. 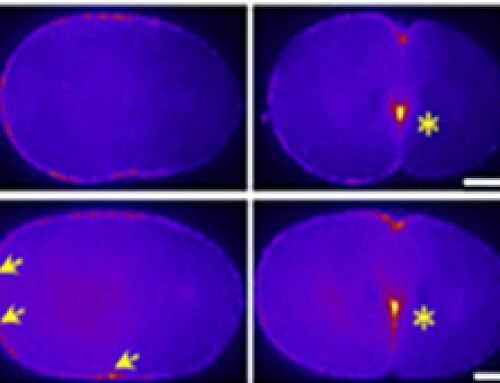 This suggests that the DAAM1-actin filament interaction prevents DAAM1 mobility. Fluorescence recovery after photobleaching (FRAP) experiments revealed that DAAM1 has a slow diffusion rate and a high immobile fraction, demonstrating that it is partially immobilized in the cytoplasm, in contrast to the formin mDia1. The movements and intensity of DAAM1 and actin were followed with photoactivatable tracking and FRAP, respectively. In locations where there was more DAAM1, actin was less mobile, and conversely, in regions where actin was more mobile, DAAM1 was highly diffuse. This provided further evidence of the close physical association between DAAM1 and actin. Both the N- and C- terminals of DAAM1 are involved in membrane localization. At the N-terminus, experiments with truncated DAAM1 and analysis of the DAAM1 sequence revealed that two cysteine residues at position 16 and 17 are highly conserved, and extremely susceptible to palmitoylation. Reversible palmitoylation is a well known method for targeting proteins to the membrane. At the C-terminus, it was found that removing the last 33 residues (residues 1045 to 1078, containing a cluster of basic amino acids) led to DAAM1 remaining in the cytoplasm. Using both these findings, a mutant DAAM1 was created by replacing cysteine residues with alanine at position 16 and 17 at the N-terminus, and deletion of the basic residue cluster at the C-terminus. 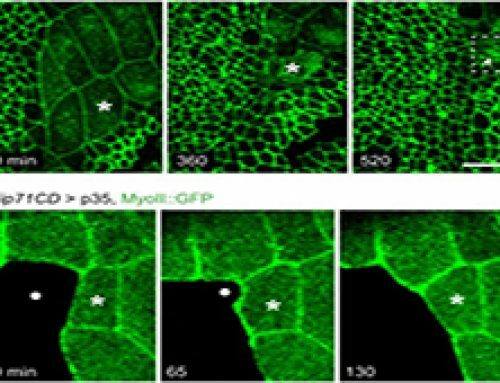 This DAAM1-NC is lacking membrane localization domains at both terminals and therefore remains cytoplasmic. In order to created a membrane bound DAAM1, rapamycin was used to trigger heterdimerization binding between proteins FRB and FKBP. FRB was targeted to the plasma membrane, and FKBP was linked to DAAM1. Therefore, addition of rapamycin should induce translocation of cytoplasmic DAAM1 to the membrane. FRAP was used to determine DAAM1 mobility. 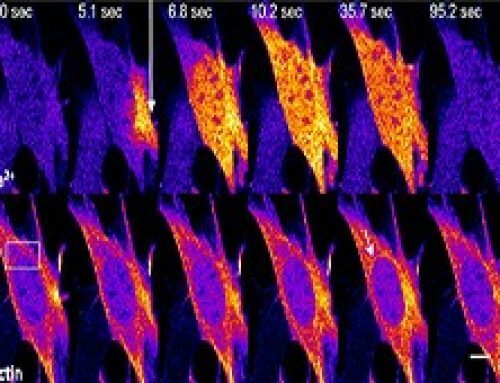 Photoactivatable tracking of DAAM1 was coupled with FRAP of actin to simultaneously observe DAAM1 movement and actin filament mobility. DAAM1 mediated organization of short actin filaments at the nodal network facilitates regrowth of the actin cytoskeleton. Using these short actin filaments as building blocks may be faster than assembling individual actin monomers. Together, this system allow rapid reconsititution of the actin cytoskeleton after depolymerization. This depolymerization may occur in vivo after exposure to mechanical stresses or bacterial toxins. The ability to rapidly recover structural stability after cytoskeletal disruption could promote cell survival and function.